1. PURPOSE To provide information on health hazards likely to arise from short-term exposure to Cellfood by the oral route. 2. PROCEDURE A group of Sprague-Dawley derived, albino rats was received from Ace Animals, Inc., Boyertown, PA. The animals were singly housed in suspended stainless steel caging with mesh floors. Litter paper was placed beneath the cages and was changed at least three times per week. CELLFOOD is a highly concentrated proprietary liquid formulation comprising a host of trace elements, minerals, enzymes, amino-acids, solvated (dissolved) oxygen and deuterated hydrogen. It is sold as a complete mineral and nutritional supplement to enhance the biochemical activities and functions of the body. In a recent study conducted at Augustine Scientific Research Center, surface tension as a function of concentration for CELLFOOD? in a glass of water was measured using a Kruss Processor Tensiometer K100 with automated dosing. 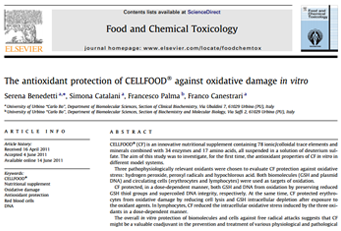 Based on the observed efficacy of CELLFOOD in clinical application at NuLife Sciences over a fifteen (15) year period, the following compilation of research results utilizing darkfield and brightfield microscopy has been compiled.